Samara’s master cabin features an innovative open plan layout, wall partitions allow views right across her substantial beam while maintaining privacy where needed in the ensuite, and concealment of stored items in the walk in wardrobe. Removing large portion of the walls on both sides of the master, enabled a great view and nearly doubled the space in the stateroom. 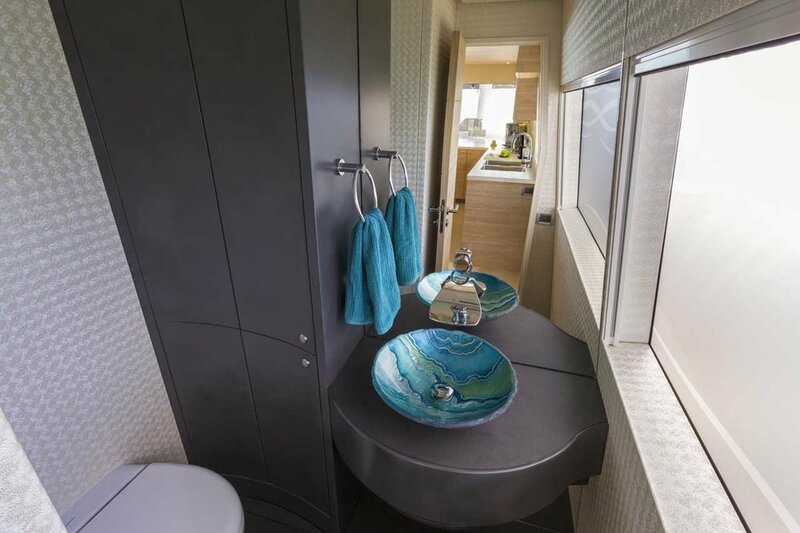 The design of the Master Bath counters features backlit Cielo Azul marble slab and faucets floating out of mirrored mullions into oblong vessel sinks. Another backlit piece of stone shaped like a surfboard, decorates the aft wall of the bath. A smart glass window at the head of the king size bed extends views through the length of the vessel, with the flick of a switch it turns opaque, in combination with blinds on each window, total privacy can be created. On the foredeck a saltwater hot tub brings the ocean aboard for aquatic relaxation and reflection in any climate, being sunk into the deck and embraced by structure on each side assures privacy without detracting from the view. Shade sails can be set to provide additional shelter, with an open span over the hot tub preserving views of the stars at night. Entertainment in the master suite is provided by a 40” TV concealed in the ceiling for viewing from bed, with an accompanying sound system; dimmable LED lighting sets the mood. The lower deck accommodates two guest cabins and two crew cabins, each with an attached ensuite, independent audio systems, air conditioning, and dimmable LED lighting. Guest cabins are in the forward section of the hulls, featuring queen size beds, two large hanging wardrobes each, and additional storage below the foot of the bed. An opportunely placed window at the foot of each bed bathes the spaces in natural light and creates a connection to the marine environment. Crew accommodation can be found in the aft quarters, these spaces are connected to the engine rooms through a sound proofed door in the ensuite. This provides the option of direct access to the aft deck through the engine rooms so as not to disturb guests. The port side holds the captain’s cabin, featuring a double bed and a desk, this space is fitted out to the same high standard as the main guest accommodation as its likely to be used as such. On the starboard side a bunk room with a double bed and single bunk is intended for crew or guests. The forward and aft cabins are separated by the midship stairways, these also house laundry facilities and general storage. This spatial buffer between the cabins ensures supreme privacy.